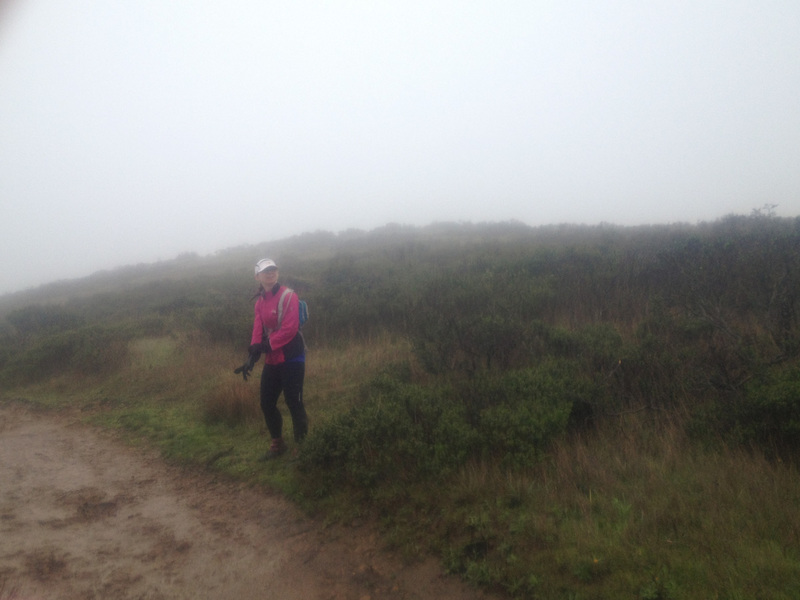 We chose the North Face Endurance Challenge 50k in the Marin Headlands north of San Francisco because it's an easy flight, near a city we like, on some fun trails with gorgeous views and likely decent weather in early December. What we ended up with is a radically different story, which I will preface by saying that both Ann and I enjoyed the run. It was challenging, and we enjoyed it. Our first "view" of the water. I got up at 4:15am to leave Berkeley by 5am, pick up Ann at her hotel in Mill Valley, and get us over to the shuttle a mile away, leaving at 5:45. 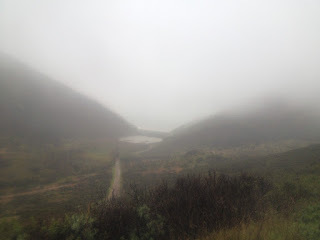 It didn't look that bad when I awoke, but by the time I drove across the bay, with foggy gusts of rain whipping sideways at the car, I knew we were in for it. We boarded the bus (#666, seriously) with perfect timing and were unceremoniously dropped off twenty minutes later in the dark, with about a quarter of a mile to trudge through a muddy, underwater, invisible trail to the start/finish area. There we got in line to leave our drop bags, but decided to stay inside the U-Haul trucks with the rest of the smart people who wanted to stay warm and dry. Well, drier. There wasn't much to see for the first few miles of the race. A very long hill led us up to a eucalyptus grove. On the downhill, while Ann and I gingerly picked our way down the steep, slippery trail, other runners bombed past us on both sides, flailing-- and falling-- wildly, splashing as they passed. That was the scariest part. After that first small loop, people were more spread out and we even saw a peek of a small beach. The trail narrowed and took us very near the water. Although we couldn't see much, the sounds of the waves and foghorns were atmospheric. As we neared the top of a rise and were told it was the out-and-back. We peered over the edge and saw a steep, muddy mess of people headed both up and down, many of them no longer on their feet. My first thought was "This is a joke." I saw a guy "surf" down it. I tried to keep to the grassy edge, but it wasn't entirely possible. During this slow section, we saw a woman with a race bib emblazoned with "PACER" just barrel down the center of the hill, calling out in a New Zealand-ish accent to get out of the way. It was amazing. I don't know how she stayed upright. This out-and-back had a little loop at the bottom, which was a welcome respite before heading back up the mud slip-n-slide. The way up felt a little less precarious, although I did slip twice and have to put my hands down, sunk two inches deep in mud, so that I didn't fall. Ann adjusting gear. The conditions are hilarious, so I took a photo through the plastic bag my phone was in. From there we worked through some steady climbs, walking and running a little bit, grateful for the lesser mud. We got to the main aid station at mile 17.7 where we had drop bags with dry gear, changed our shirts, and added that gear to our backs so we didn't have to wait for our stuff to be delivered after the very end of the race. By now it was (mostly) not raining hard, the wind had (mostly) died down a bit, and we felt good. We got methodical with our run-walking, and really cranked it out. I hit my "bad spot" complaining until Ann snapped me out of it, and we were able to catch glimpses of the promised views when the fog cleared a few times. The difference in weather really made it feel like we hadn't been through this section twice prior. Probably the toughest part was the out-and-back that took us within five feet of the finish line, which was a mile uphill on a road, with about six miles left to go. So mean! But once we got back on the trail we chatted, joked, and really enjoyed ourselves. I'm not sure I'd do this race again just as it was, but I would sign up if the weather were guaranteed to be nice. We were an hour and 25 minutes faster than our previous 50k (which was twice the elevation gain), so I think we really would've rocked it in decent conditions. Also, the best race photo of my life was taken, so maybe I'm biased! I think there is only one word to describe this race, epic. North Face did an excellent job of communicating and managing the race.